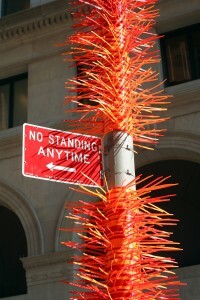 As I was walking to the office today, I saw hundreds of wire ties wrapped around the street lamps in Astor Place, their tails sticking off of the posts like a million colorful porcupine spines. Naturally, I had to stop and take some photos, but as I did so, I noticed that everyone else who walked by, hands clutching their Monday morning coffees, would do the same dance: they would be walking, eyes down or straight ahead (as is the New Yorker’s way), when the colorful posts would catch their gaze. They would pause, ever so briefly, and a smile would spread across their faces. Every. Single. Person. Now I work a lot. I’ve been working on a startup for the past five years (one of the lesser known NYC startups, but that’s a topic for another day), I run an annual ruby conference, and I take a boatload of photos. And sometimes, when I’m sitting, bleary eyed, in front of my computer, I can not for the life of me figure out why I’m working instead of, well, any of the myriad other things that people do with their time. And obviously, the first thing that comes to mind is that enjoy the work. And that’s true. But if I were to think a little more about what exactly I’m doing, and why exactly I’m doing it, I would remember that really, I’m trying to make people’s lives just a little bit better. I am trying to take what I know how to do and I’m trying to translate it into a tangible action that will touch other people and improve their days. I’m trying to make them smile. Now I realize that not everything that I can do can be as whimsical and actively smile-producing as a colorful streetlamp, but with every speaker I choose for the conference, with every photograph I make for my website and every line of code I push for my startup, I am doing so in order to try to touch just one more person out there, and hopefully light up their day just a little more. Perhaps you’re trying to do the same? ← Lion Launchpad = Windows 3.1 Program Manager?